Good morning Nosh Show listeners! We've got a great show for you where we learn about Marvo's creative way of eating pizza, Eric's fear of fruit floating in milk and Ryan tells a joke that I laugh at but will make little sense to the listener because the context for it got edited from the beginning of the show (oh, I tease, I tease, you know I love Marvo's mad editing skills!). We've also got Happy Happy Mystery Package Fun Time where my guessing skills are on point! My nosh of the week goes out to Gelato Fiasco's new Sriracha Peanut Gelato because I'm still amazed at how much I enjoyed it. There's proof I ate it here and then Nick has an official review coming on Friday as GF faces off against another Sriracha flavor. I know who my money is on! 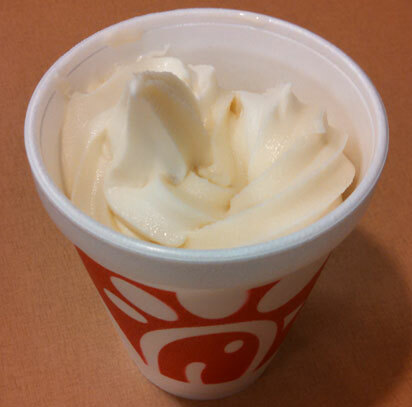 Oh, one last note: I did indeed try Chick-fil-A Icedream. My buddy and I had just gotten out of the enjoyable Avengers: Age of Ultron and he needed food. It was late so I went with a simple small icedream. It wasn't bad at all, definitely a bit unexpected as it was a bit icier than your typical softserve, but the flavor was fine. I kind of wish I had noticed that they had a cookies & cream milkshake. I also got several recommendations to try that new frozen lemonade they have but I'll have to go back for that since they were out of lemonade for the day.